The Chicago Park District (a/k/a the ‘Garden in the City’) is one of the oldest and largest municipal owned park systems in the world. Many of our parks were originally created or shaped by nationally acclaimed architects, planners, landscape designers, or artists, such as Daniel H. Burnham, Frederick Law Olmsted Sr., Jens Jensen, Alfred Caldwell, and Lorado Taft. As the steward of a world class park system, we continue to strive to be true to our mission and core values. Our most important task is to bring children and families into our parks and give them great reasons to stay and play for a lifetime. We work to make the Park District the first choice of parents and children for the best in programs, events, camps and daily leisure activities. We target key segments of Chicago’s youth population and develop opportunities that align with their preferences and priorities. We develop exciting choices for classes and program and make it easy to enroll in them. We give every child a reason and an opportunity to play in the parks. We prioritize quality in our programs and accountability in our fiscal management to provide excellent and affordable recreation that invites everyone to come out and play. To provide the best value in recreation, we work diligently to balance expenses with revenues. Thanks to prudent financial management over the years, we remain on solid financial ground. To maintain long-term stability, we continue to find innovative and appropriate ways to bring in new revenue while making thoughtful investments and carefully managing our costs. Our goal is to maintain high quality of our programs and events while making them as affordable as possible. We use our capital to renew our aging infrastructure and leverage partnerships that produce new parks and facilities that are forward-thinking and world class. We have inherited a world class park system that has served generations of Chicagoans. We are stewards of treasures that take the form of landscapes, buildings, sculptures and parks. We must also maintain and expand our holdings to meet the current and future recreation needs of our customers. To balance these challenges, we strategically invest our limited capital resources and leverage partnerships and alternative sources of funds to do more with less. In doing so, we will honor our inheritance and build for the next generation. We support innovation and welcome new ideas. We believe that professionalism, communication, technology, and team work serve as the foundation for great customer service and a productive workplace. We do everything possible to make the Park District better for tomorrow than it is today. We implement new ideas and technologies and make program delivery more effective. We invest in our employees and provide training and the tools they need to get the job done. We open new lines of communication between our customers and each other. And we work as a team as we build toward a new future together. The Chicago Park District (Park District) encompasses more than 8,800 acres of open space, totaling 598 parks, 26 miles of lakefront, 11 private cultural institutions (e.g., The Art Institute of Chicago and The Field Museum, among others), 31 beaches, 10 harbors with a capacity of over 6,000 boat slips and moorings, historic lagoons, 10 bird and wildlife gardens, thousands of special events, sports and entertaining programs. In addition, the Park District operates a large number of recreational and cultural facilities, including Northerly Island, Lincoln Park and Garfield Park Conservatories, Buckingham Fountain and the South Shore Cultural Center. Other properties of the Park District, which are privately managed, include McFetridge Sports Center, Lincoln Park Zoological Gardens, Theater on the Lake, Soldier Field (home of the Chicago Bears) and our harbor system. The Park District is a special district governed by the Chicago Park District Act and other applicable Illinois statutes. We are an independent government and taxing authority that is coterminous with the City of Chicago. The Park District’s General Superintendent & CEO, Michael P. Kelly, is appointed by the Mayor of Chicago and confirmed by the Board of Commissioners. The Park District's headquarters are located in the Streeterville neighborhood near Chicago’s lakefront. The Park District, along with our partners, provides a diverse array of organized activities to residents with a particular focus on youth. In 2016, over 45 million participants took advantage of Park District facilities with over 375,000 directly enrolled in nearly 25,000 programs comprising an estimated 714,000 hours of programming including sports, aquatics, camps, concerts, theater and other activities. The 45 million in participants includes those attending events at Soldier Field, playing a round of golf at one of our courses, utilizing the Lakefront Trail or visiting one of the Museums in The Parks. Our total usage estimate increased by an estimated 6% between 2015 and 2016. Among the programming venues, McFetridge Sports Complex features ice skating and tennis with over 10,000 registrants in 2016 and Peterson Park Gymnastics Center provided gymnastics lessons to 5,700 registrants. The Park District operates summer day camps throughout the City with registrations of nearly 46,000 in 2016 while providing swimming-lessons through its Learn to Swim program to over 20,000 registrants. The Park District’s current fall session enrollment is approximately 82,000 with an end projection of 105,000 to 110,000. 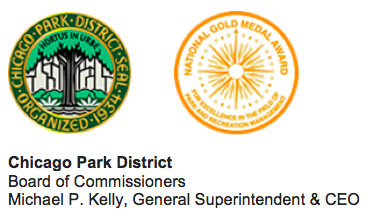 On October 14, 2014, the Park District was awarded the 2014 National Gold Medal for Excellence in Park and Recreation Management, presented by the American Academy for Park and Recreation Administration in partnership with the National Recreation and Park Association (NRPA). Founded in 1965, the Gold Medal Awards program honors communities in the U.S. that demonstrate excellence in parks and recreation through long-range planning, resource management, volunteerism, environmental stewardship, program development, professional development and agency recognition. The Park District has received this national recognition as a result of NRPA’s determination that the Park District embodies the core values of the NRPA, including conservation, social equity, health and wellness. On behalf of the Chicago Park District, we would like to welcome you to our new investor relations website. We appreciate your interest and investment in our bonds, as it allows us to make critical investments in public infrastructure throughout Chicago's park system. We are committed to maintaining our strong bond ratings, and to being as transparent as possible with the investor community and public at large. We hope you find this website useful as you seek to better understand the credit fundamentals of the Chicago Park District. Please do not hesitate to contact our office with suggestions for how we can be doing better.